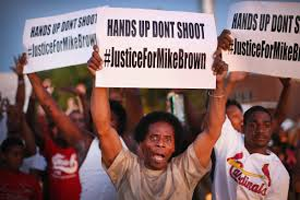 The death of Michael Brown, an unarmed teenager, by a police officer is being investigated by the U.S. Department of Justice as tension continues to escalate between residents of Ferguson, Missouri and law enforcement agencies, which now include the National Guard. The DOJ has mounted an unusually swift and aggressive response to the death of Michael Brown, from an independent autopsy to dozens of FBI agents combing Ferguson, Missouri, for witnesses to the shooting of the unarmed black 18-year-old by a white police officer, in an effort to ensure that the truth about the killing is revealed, to ease racial tensions, and to reassure those fearing a cover-up that justice will be done. Brown was shot dead in the street in the St. Louis suburb on Aug. 9. Gov. Jay Nixon asked for a federal investigation two days later, after riots erupted when the county police force confronted protesters with armored vehicles, tear gas and dogs. After the images of the military-style police response drew widespread criticism, federal officials said they were coaching local authorities on different tactics. On Saturday, 40 FBI agents started going door-to-door in the neighborhood where the shooting took place, interviewing witnesses and gathering information. 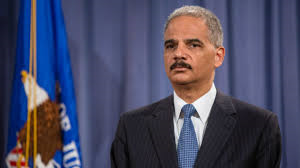 An independent federal autopsy was announced Sunday, and Attorney General Eric Holder said it was performed Monday. President Barack Obama also announced Monday that Holder would travel to Ferguson to meet with investigators and community leaders. "What they usually do is wait for the local investigation to complete itself," said Alberto Gonzales, former attorney general under President George W. Bush. Gonzales said that although he did not have all the information being evaluated by federal officials, it appeared to be an aggressive and unusual response to an unusual case. "They're going in with one goal: to ascertain the truth. And to do so in a way that raw feelings can be comforted and soothed," said Gonzales, who is now dean of the Belmont College of Law in Nashville. Ferguson is about 70 percent black. Ferguson's mayor is white, as are five of six city council members and 50 of its 53 police officers. Many in Ferguson and beyond fear that local officials will not act fairly in determining whether to charge the officer, Darren Wilson, with a crime. St. Louis County Prosecuting Attorney Bob McCulloch, who is in charge of the investigation, also is white. He comes from a family of police officers, including his father. When he was 12, his father was fatally shot by a black man while responding to a call. In a 2000 case, McCulloch brought no charges against two officers who fired 21 shots into a vehicle, killing two black men during an attempted drug arrest. McCulloch has declined calls to step away from the case, saying in a television interview, "I've been as fair and impartial and done as thorough of a job as we could." At the Department of Justice, Holder, the first black attorney general, who took office promising to fiercely fight discrimination and inequality, has been an increasingly visible presence during the Ferguson case. That is reassuring to Blair L.M. Kelley, a history professor at North Carolina State University. "I'm glad to see him being proactive," she said. "That's the best way to tamp down anger on the streets, is to pursue justice in an evenhanded manner. I think he knows that and is using his position to best serve a broader sense of justice." "It puts pressure on the local investigators to do their best, because he's there," Kelley said. Sampson Cheney III, a Ferguson resident who lives 50 yards from where Brown was shot, is glad that federal agents are on the scene. He was interviewed by an FBI agent Saturday. He doubts that local officials would file charges against the officer. "It seems (federal officials) don't have a horse in the race," Cheney said. Holder and White House adviser Valerie Jarrett spoke with representatives of civic groups who had been invited to participate in a White House call Monday afternoon. A person on the call said participants were told that federal investigators have interviewed about 200 people so far, some referred through the National Association for the Advancement of Colored People. The call was closed to reporters, and the participant spoke on condition of anonymity because of the no-media ground rules. Kelley said Holder's actions have been reminiscent of the role played by Attorney General Robert Kennedy (whose portrait hangs outside Holder's office) during the civil rights movement, when President John F. Kennedy was trying to navigate black resistance to white supremacy in the Jim Crow South. Ultimately, the Kennedys used federal authority to ensure equal treatment for African-Americans. They also brought federal civil rights charges in some cases - a possibility that Holder's Justice Department is investigating in Ferguson. The Justice Department investigated civil rights charges after the unarmed teen Trayvon Martin was killed by neighborhood watchman George Zimmerman in Florida. No charges were filed, despite requests by the NAACP and other advocacy groups. But there are important differences between the Kennedy years and now, said John Malcolm, a former deputy assistant attorney general, who now is director of the Meese Legal Center at the Heritage Foundation. "I don't think in this case police are like, we want to oppress black people and deny them their constitutional rights," Malcolm said. "They're responding to a riot situation, and it got out of control." Malcolm could not recall a similar federal response to a case like Michael Brown's. "It's certainly aggressive," he said. "It sends a message that the federal government is concerned and wants to get involved and de-escalate the tension as soon as possible." Malcolm said that strategy could backfire, if it fans false assumptions that there is a racial component to the case. But overall he did not have any criticism of the DOJ's actions. "This is a rapidly deteriorating situation," he said. "Clearly in the public mind there is a racial component to how police have acted. Police have not helped themselves with their overreaction to the situation. So I think there are times when (federal involvement) can help defuse the situation. Let's hope that's what happens here." Jesse Washington covers race and ethnicity for The Associated Press. Follow Jesse Washington on Twitter. Associated Press reporters Corey Williams in Ferguson and Ricardo Alonso-Zaldivar in Washington, D.C., contributed to this report.